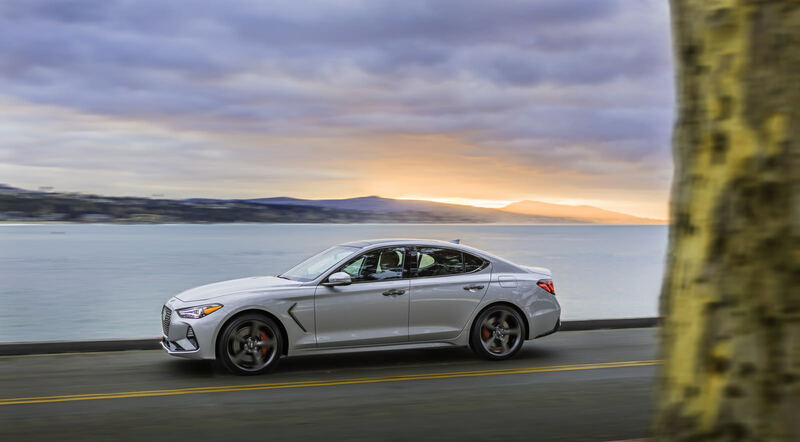 When it comes to market this summer, the 2019 Genesis G70 luxury sport sedan will reset benchmarks and expectations in its class for the holistic integration of performance, body strength, refined luxury and aerodynamic design. G70 is the third of six new Genesis models slated to debut by 2021, and the final sedan of the lineup. As the first Genesis model in the highly competitive entry-level luxury segment, G70 will outperform legacy luxury sport sedans with driver-focused performance. "The foundation for any kind of car that performs well dynamically is an incredibly rigid platform," said Albert Biermann, President and Head of Vehicle Performance Division of Hyundai Motor Group. "That translates not only to performance, but how it feels down the road as well as safety achievement levels." The synthesis of iconic elements of the Genesis design ethos, Athletic Elegance, contribute further to a sleek, aerodynamic design. G70 has the lowest overall height and widest overall stance in the segment providing exceptional dynamic performance from the resulting low center of gravity. The kinetic form language of G70 was engineered to return a sleek 0.28 Cd, allowing G70 to slip through the air. When fitted with aggressive 19-inch wheels and Michelin? Pilot Sport 4 summer tires, G70 returns 0.29 Cd. Through the extensive application of hot-stamped parts and reinforced connecting structures, G70 has among the strongest body structures in its segment. Strategic use of lightweight aluminum for the hood and strut tower reinforcement bars helped the G70 lower its center of gravity. An integrated frame reduces the number of physical parts needed to strengthen G70. Fundamentally, the robust, reinforced structure is part of an effort to provide class-leading occupant safety, just like other Genesis models. The additional benefit of such a rigid body structure is the ability to finely tune the suspension for both excellent ride quality as well as superb handling dynamics. "We used high-strength steel, aerospace-grade adhesives and strategic lightening with aluminum to create the ideal balance of stiffness, light weight and competitiveness," Biermann said. "The proof is in how G70 handles on a spirited drive, whether that's early on a Sunday morning on a hilly, country road or on a daily commute to the office." No matter the driving situation, G70 raises the bar for the luxury sport sedan segment, with a 0-to-60 mph time of 4.5 seconds (3.3T RWD, using Launch Control) and a mechanical limited-slip differential (LSD), standard on 3.3T RWD and optional on 2.0T RWD. A multi-plate mechanical LSD is utilized in the G70 to enable a) higher torque capacity, b) better handling control, and c) lower noise, vibration and harshness (NVH) than other types of LSD. The G70s combination of mechanical LSD with available all-wheel drive (AWD) is unique and provides sharper handling performance than competitive vehicles in the segment. G70 is available with either an up-level 3.3-liter twin-turbocharged gasoline direct-injected V6 engine or a 2.0-liter turbocharged gasoline direct-injected 4-cylinder engine. The standard, 8-speed automatic transmission offers rev-matching technology and gear-holding technology for tight corners. As an increasingly rare treat these days, a 6-speed manual transmission is available as an option on the 2.0L T 4-cylinder engines equipped with RWD. Manual transmission equipped G70s are offered in a comprehensive performance package that includes a more powerful engine with unique sport exhaust, high-performance Brembo brakes with enhanced performance pads and additional weight reduction measures. With either engine, G70 is available with standard RWD or optional AWD, which actively distributes optimal traction forces between the rear and front wheels dependent upon the current driving circumstances and drive modes selected. To reduce unsprung mass, G70 has insertion-type MacPherson struts in front for the connective structure that increase stiffness, compared to a conventional design. In the rear is an independent, multi-link suspension that balances driving stability and performance. An optional, electronically controlled sport suspension optimizes ride comfort in real time and a high performance Brembo braking system is available which delivers superior braking capability and fade resistance. Enhancing the driving appeal of G70 is Active Sound Design, which offers drivers the ability to enhance the interior ambiance with a throatier engine sound. Sound settings were created based on the science of harmony, to produce bright, euphonious tones that pair well with all types of roads and driving conditions. Five available drive modes?Sport, Comfort, Smart, Eco and Custom?synchronize with the Active Sound Design profiles. The performance-focused G70 luxury sport sedan has been tested under the most challenging environments and surfaces in the world, including Death Valley (U.S.), northern Sweden, the N?rburgring (Germany) and the Alps (Austria) for driving stability, handling, durability and power delivery. G70 will launch in the United States in summer 2018.